In a recent picture book workshop at the New Jersey Education Association Annual Convention in Atlantic City, I shared with participants some full page spreads from One Wolf Howls , a gorgeous picture book from Sylvan Dell. The audience had to laugh at itself after responding with "ooos" and "ahhhs" like a classroom of kindergartners. But that's exactly the reaction this book often receives, so I'm pleased today to offer copies of One Wolf Howls to three lucky winners. deep in the woods where the harsh winds blow. 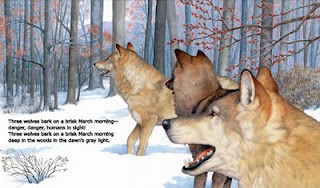 The connection that illustrator Susan Detwiler makes between her dog and the wolves is an interesting one, worthy of further study in the classroom. In what ways are wolves and dogs alike? How is some common dog behavior explained by wolf pack behavior? A helpful book for further "insider information" on wolf behavior is Jim Brandenburg's Scruffy: A Wolf Finds His Place in the Pack (available in most libraries). As a photographer for National Geographic magazine, Brandenburg spent a good deal of time with a wolf pack in the cold north and observed the individual roles taken on by wolves in that society. Other nonfiction recommendations: Wolves by Seymour Simon and Wolves by Sandra Markle (mini-lesson topic: create a memorable title!). These books might lead in turn to a unit on wolves and their typical role in children's literature (such as Little Red Riding Hood and The Three Little Pigs) compared to their real-life roles in the food chain. In recent years picture books such as The True Story of the Three Little Pigs by A. Wolf and The Three Little Wolves and the Big Bad Pig have started to humorously challenge the traditional versions of the timeless tales in which the wolves are villains, and instead cast them as hapless victims who find themselves in "the wrong place at the wrong time." Another I'd suggest is The Wolf's Story: What Really Happened to Little Red Riding Hood . Students may enjoy splitting into two groups and taking sides in this debate. Students could even take the identities of storybook characters (as well as true-to-life wolves) and argue for and against the wolf's reputation. 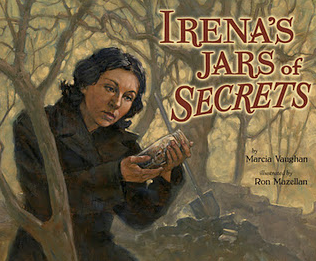 Be sure to visit Sylvan Dell for other great nature and science books for young readers. Thanks for the fantastic write-up, Keith! I do a program for 5th and 6th graders in which we compare various books about wolves in order to explore genre differences. I love the idea of a debate! Thanks for the fantastic write-up, Keith! 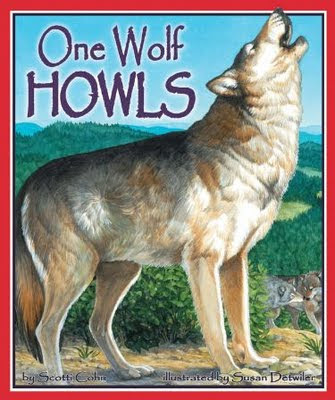 I do a program for 5th and 6th graders in which we compare various books about wolves in order to explore genre differences, using some of the titles you mentioned. I love the idea of a debate! This is a wonderful book. I'm adding it to my Amazon wish list as we speak! Here's a link to MEET ME AT THE CORNER, Virtual Field Trips for Kids (www.meetmeatthecorner.org). I think that this video podcast for kids about a wolf rescue project in Colorado goes nicely with this book. Watch until the end to hear the wolf howl!